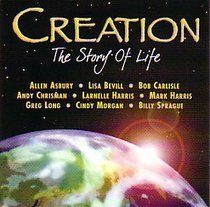 CREATION: STORY OF LIFE is a collection of songs that are inspired by and pay tribute to our Creator and His creation. Produced by Don Koch, this album tells the story of the perfection of the garden, the glory of a loving Father, and the journey from sin to forgiveness. Find the wonder of nature's existence listening to these newly recorded songs written and sung by artists such as Greg Long, Allen Asbury, Cindy Morgan, 4-Him's Mark Harris, Bob Carlisle, 4-Him's Andy Chrisman and more! About "Creation: Story of Life"